Before I went up to #RootsTech 2014 in Salt Lake City, Utah, I was looking at several websites hosting family trees using wiki software. It is evident that the FamilySearch.org website uses some form of wiki software as the basis for Family Tree, but there are also quite a few other programs out there utilizing wikis. While at RootsTech 2014, I had a opportunity to talk to Chris Whitten, the WikiTreer-in-Chief, and to Tami Osmer Mize, for a while about WikiTree.com and other programs. Of course, I am a dyed-in-the-wool wiki person myself, having worked on the FamilySearch Research Wiki since 2008. Wikis are the best programs yet devised for handling huge amounts of data that changes over time. They are best suited for collaborative and interactive data especially such as that involved in family trees where new changes are being made regularly. Almost every time I talk about wikis I get the same old response about why they don't devolve into a pile of garbage. Perhaps it is time to write about that issue again but not right now. I am afraid I gave Chris Whitten a bit of a hard time. Presently, I am working through the issues of collaborative family trees. I see many different family tree programs out there, some based on the one-tree wiki model and some set up for each individual to have their own family tree. The real issue seems to revolve around the polarity of having a personal family tree which the researcher controls completely and which is set up so that no one can change or contribute information directly to the family tree or on the other hand a monolithic community based and totally collaborative family tree such as those maintained using the wiki program. I am taking this issue one step further and attempting to understand how the two polar opposites can exchange data so that we may begin to resolve the extreme amount of duplication. For example, I did a search in WikiTree.com on my surname, and got a list of 2144 Tanners. I then did a place search for "Arizona" and found only one individual associated with the state of Arizona. I am aware, that there are several unconnected and unrelated Tanner families in the United States. Tanner is not an extremely common name but it is common enough to create some genealogically related difficulties. The one individual in WikiTree.com who was born in Arizona, David Hyrum Tanner (b. 1898, d. 1974) was related to me through my 3rd Great-grandfather, John Tanner (b. 1778, d. 1850). I found David Hyrum Tanner in at least five other family tree websites. Of course the idea here of using a wiki program to collaborate and build a single family tree is extremely laudable. But the main question is still unresolved of how we bring together all of the scattered information from so many different family trees on the Internet. Of course, I find the wiki model, as expressed by WikiTree.com and others to be far more workable than the unconnected family trees on the other websites. The larger websites address the issue of the fragmented individually submitted family trees by providing a search mechanism than applying identical individuals in other individually populated family trees. I'm certainly not an advocate for changing the overall system to eliminate personally maintained and even private online family trees. I'm merely expressing a concern for the fragmentation and the difficulty of researching all of those fragmented entries scattered across dozens of websites. Ultimately, my concerns are with genealogies file standards that allow information to be exchanged between programs whether they be online wiki-based family trees or individually maintained desktop genealogical database programs. 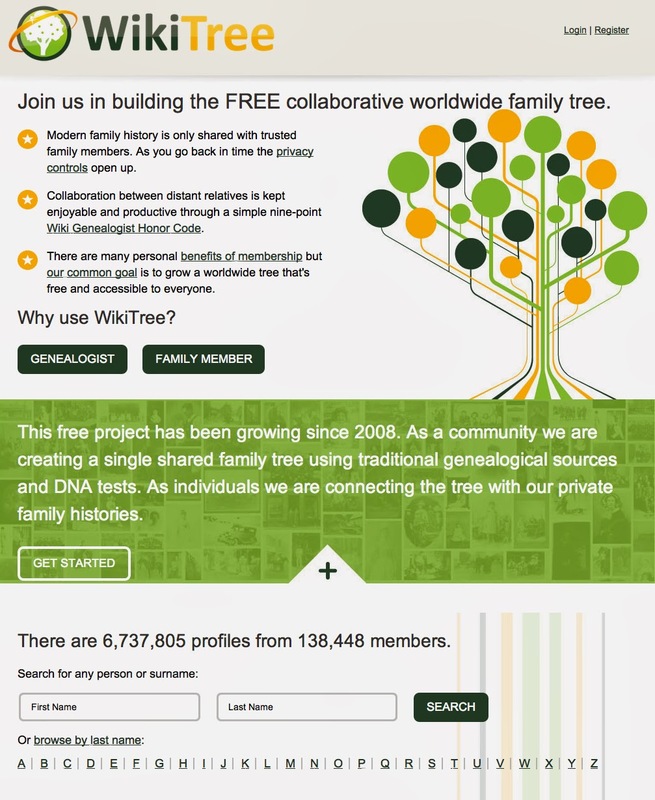 Right now, programs such as WikiTree.com are the best alternative we have for storing genealogical data in a way that allows collaboration and contributions by a large number of family members simultaneously. I appreciate the opportunity I had of talking with Chris Whitten at RootsTech 2014. Thank you, James. It was good to meet you at RootsTech. You didn't give me a hard time. :-) I appreciated the chance to talk about these issues. They're not going away any time soon. FamilySearch's GEDCOM-X model, when it settles down, may be an important contribution to the data exchange problem. We're going to keep working on that here at WikiTree. I'm so glad I have my family tree on WikiTree! A woman in Ireland who purchased vintage postcards addressed to my 2nd great-grandaunt contacted me because my tree is on WikiTree. I now have a new friend in Ireland, and over 50 of these precious Engle Family postcards from the early 1900s. I Love Wikitree! I am trying to find the time to be more contributory. I am very thankful for relatives of ancestors, who my own tree connects too. I wish I knew of these connections earlier, I am finding a Grandfather and or Grandmother and having alot of fun reading about History.....Thanks too all!